Love my review for Affordable Scarves? 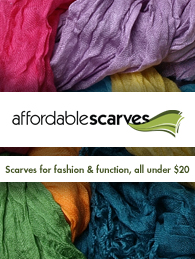 free scarf or $20 gift certificate to AffordableScarves.com. All of which must be done by 2/9/2011 at 12pm in order to win. I like the Trisha Leopard scarf! Thanks for the giveaway! I would get the Amanda Circle scarf! Thanks for doing this giveaway. The Hadley loop scarf is adorable! What an awesome giveaway. I am a fan of AF's Facebook page as Allison Berta McClure! Hadley loop scarf in white, anyone? I adore the HAdley loop scarf in white! Id get the Colin Striped Men's Scarf for my Dad for Valentines Day! Its cold here and I think it would look great on him!! I like the Lorreta Colorblock Scarf! definitely the Eliza Trekker Pashmina in copper/orange! love that site. I loved the Sequin Party Shawl in grey. Super cute! Love the Amanda Circle scarf. I've been wanting a red scarf for a while! hi! i'd get the corey loop scarf in grey. looks so cozy! I would get the Laurene v-neck tan poncho!!! Love it! I would love to own the Hadley Loop Scarf in Cream. So beautiful! I love the Laurene V neck poncho! would love the Hadley loop scarf--I've yet to try that shape. also became a facebook fan. I am a fan of affordable scarfs on facebook! I love the Hadley Loop Scarf! Hi Megan :) I love scarfs!! Is this open for worldwide? If it is, then pls count me in.